The Lucky Ones - Trailer from Creative Liquid on Vimeo. Produced by Creative Liquid Productions, The Lucky Ones follows the long road many animals must make to find their forever homes. The Lucky Ones was filmed on location in South Carolina, Puerto Rico and Washington, DC. 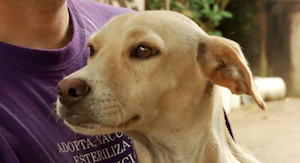 The film profiles Lucky Dog Animal Rescue and the tireless work of hundreds of volunteers to battle animal overpopulation.